The primary factor limiting grizzly bear recovery is human-caused mortality. Bears die when they get into trouble with people’s garbage, livestock, when they are hit by cars and trains or illegally killed. By preventing these conflicts we help both people and bears. 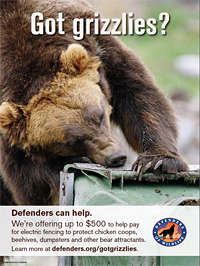 Click the image to download a poster for the electric fencing incentive program to help us promote this program. 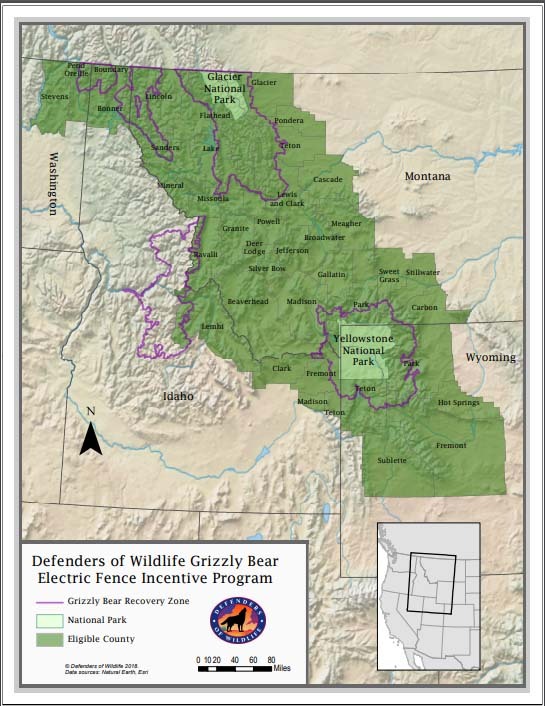 Defenders of Wildlife will reimburse 50% of the cost of an electric fence (up to $500) for securing grizzly bear attractants, such as garbage, fruit trees and livestock, in eligible counties in Washington, Idaho, Montana and Wyoming. Application and brochure for 2019 projects now available.